Sebastian Beach Grill and Bar is not named for the animated crab in Disney's Little Mermaid. Though it could have been. 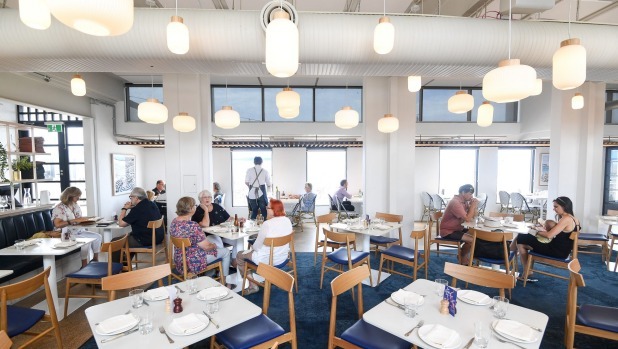 The newest project from prolific restaurateur Dave Parker (a backer of Neptune, San Telmo, and Pastuso) with his friend Alex Brawn is set in Williamstown's heritage-listed beach pavilion. 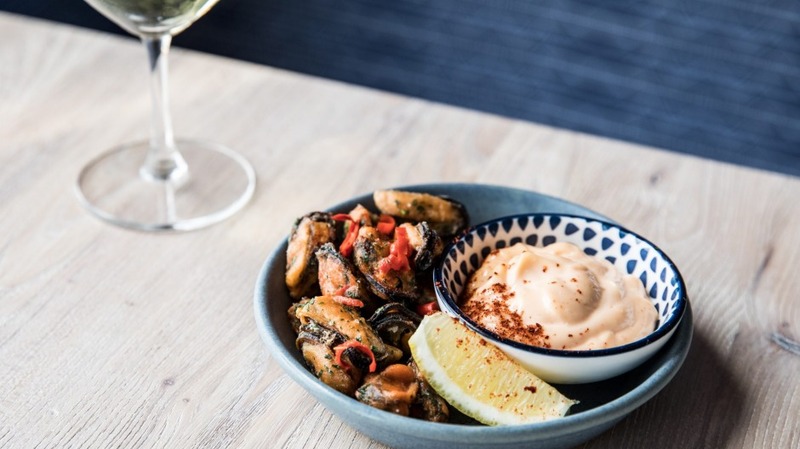 If the weather is right, you can scuttle straight out of the sea and onto a picture-perfect deck where the well-shod and sandy-toed alike are knocking back Estrella beers, cocktails and fried mussels as the sun sets. And if you never knew Williamstown had a cracker shoreline, it's truly an otherworldly experience. Sebastian is of course named for the gustatory playground that is Spain's San Sebastian, the city that sparkles with Michelin stars and snack-filled bars where chasing pintxos (tapas of the Basque region) and snoozing on the sand constitutes your entire agenda. That's an itinerary you can replicate here. And should. 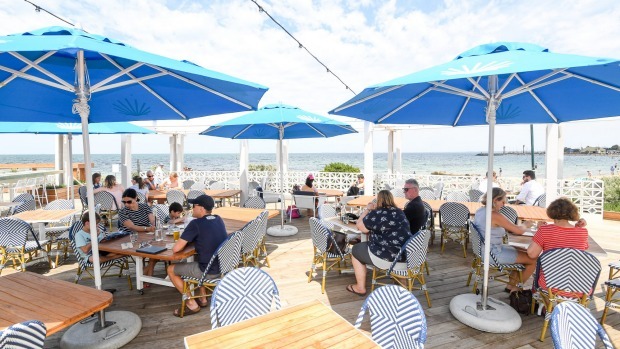 The deck (low key, no-bookings) is festooned with blue and white wicker and umbrellas, a perimeter of sea-admiring benches and a dedicated bar where you can order the same (slightly reduced) menu as the restaurant. You can also get at the full Spain-meets-Melbourne cocktail and wine list, which works for a beachside ride. Beers are the sessionable stuff from proven crafty locals like Two Birds and Cavalier, or multinational Pilsners and Moritz. It's a shame cider doesn't get much attention beyond Napoleon given it's a San Sebastian staple, but sangria does, and a fresh, bone dry spritz spiked with sherry and pomelo sherbert and nicely embittered burnt orange pisco sour shows the bar can throw a drink. All this, without putting on real shoes or pants. The ambition is writ slightly larger inside, where you'll find a dining room of deep tan banquettes and chef Leigh Robbins' extended menu including cured fish plates, and the option to do $60, $75 or $90 set menus of all things grill-related. 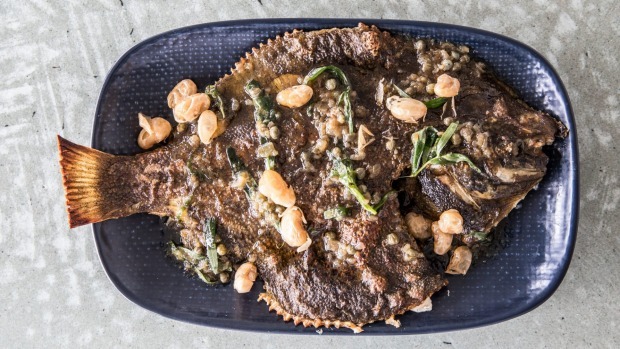 It's a menu you'd call Spanish-ish, but certainly built for Melbourne. Not a single pintxos sits on a bread base. Instead, it's unadorned salty red and pickled white Cantabrian anchovies; crunchy, molten leek croquetas jazzed up by a potent leek ash aioli I'd slap on anything, or a bowl of mussels, plump, de-shelled and lacy-battered to dunk in fermented chilli mayo like protein-rich chip replacements for gym junkies. As with most restaurants right now, Sebastian is all about cooking with fire. 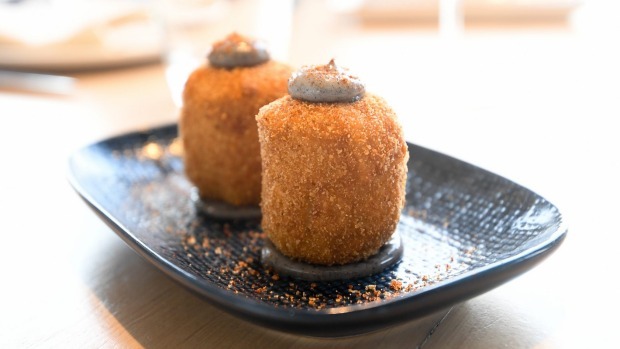 And it bears noting that the craze has roots in San Sebastian, thanks to Etxebarri, the World's 50 Best Restaurants stayer that has mastered the dark art of transforming food via coals and little else. Sydney chef Lennox Hastie of Firedoor brought that knowledge back to our shores, and the terms blistered and charred have besieged us since. But Robbins' dishes seem better defined by how he dresses rather than cooks them. Coal roasted mushrooms (I think they mean roasted over coals, rather than anthracite) get their mojo from a lively horseradish chimichurri. Octopus tentacles are tender vehicles for a lively, herby a la grecque dressing. Robbins has a knack for finding a tight acid balance with his condiments, and they can make a dish. A rubble of lightly seared calamari curls is a little blah until you mix them with a squid-inked romesco, all peppery earth and ocean at once. A wedge of firm, sweet pumpkin washed in a tangy, nutty pool of creme fraiche, walnuts and toasted seeds winds up being a dish of the night. It would be nice though to sometimes see Robbins really harness that grill's power and let the produce shine. A dull sear on our flank steak leaves it gummy and wan when you hanker for a hot-scorch crust that makes steak delicious. Blistered tomatoes are overwhelmed by their balsamic dressing and the same issue plagues our sand flathead, shouted down by an albeit delicious, caramelly, burnt anchovy butter peppered by crisp butter beans. The flavours are good, there's just sometimes an exuberance of them. No matter. There are nits you can pick, but few are major. Warm sparkling water is pretty sloppy and the wine guys probably need to bone up on their Oz-Spanish-Argentinian list to be helpful. Beyond familiar big house champagnes, Beechworth chardonnays and tempranillos, those who haven't romped around Basque country might need the cliff notes on txakolinas (the lively white that's the go-to at pintxos bars) and the rarer sumoll, a light-on red from Penedes from an almost extinct varietal. As a straight restaurant, Sebastian has landed as a good restaurant with tons of potential to grow. As an experiential package it's a total trip. 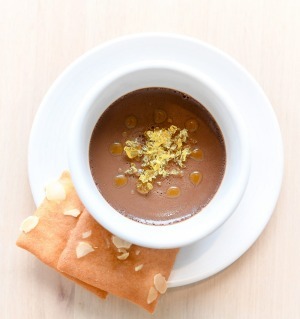 It's sea and sand and snacks and sips and the silkiest chocolate pot in town. Do you live here? Congratulations. Nowhere near? Take a short ride to be majorly transported. Pro Tip: Cycle from the city and for $2.70 take a punt across the Yarra. Go-to Dish: Pumpkin with creme fraiche and walnuts; mussels and fermented chilli.